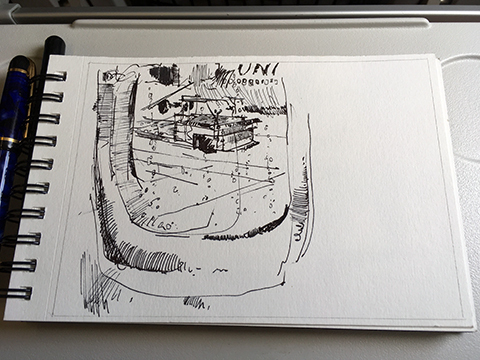 USk | Sketching … Always! I sketch, draw, or paint almost anywhere. It has been a busy late April, May, and early June for me. These past eight weeks, I have made most of my images while working away from home quite a bit. Mostly it has been around Virginia but also out in Utah, and even some while actually traveling. It doesn’t hurt that I will happily work in the full view of others … almost as easily as I do in the privacy of my studio. Abandoned Power Station, Staunton Va. 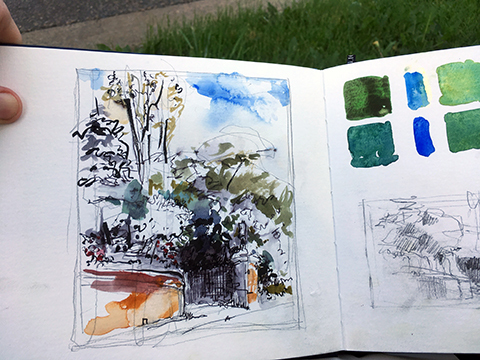 I was invited to participate in two plein-air events this spring, one in Staunton and the other in Lynchburg. 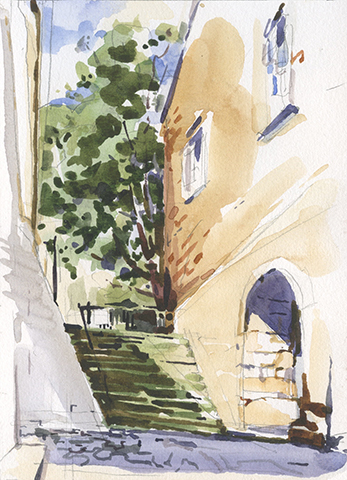 Sketching in and near the urban environment has always been an interest of mine. It shouldn’t surprise my urban sketcher friends that I began to get serious about making art way back in my teens when I would go draw the “brownstones” of Wichita KS. I still like those Hopper-esque cityscapes. For the Lynchburg event, I was even asked to do a demo while I was there. It was fun to do the demonstration and the onlookers asked some wonderful questions. I sure hope I was informative and maybe even a little entertaining. 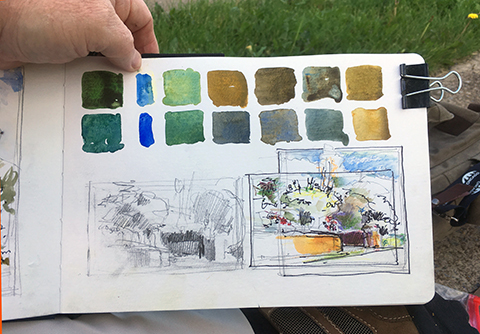 After being invited to demo at the Lynchburg Plein Air event, I had the distinct privilege, a really rare treat actually, to be able to attend part of a workshop offered by the Urban Sketchers of Fredericksburg. The instructor/leader of the event was Shari Blaukopf from Montreal. I have followed her work for several years now and have even recommended her to some of my students. It may seem like something of a busman’s holiday to some but I have always found it interesting to observe how fellow artist-educators go about presenting ideas to students. 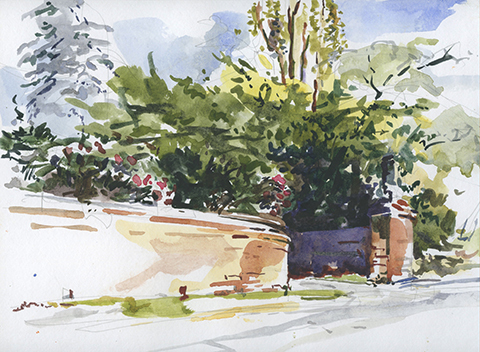 The artists of this urban sketchers’ chapter and those that traveled to the workshop did some really wonderful sketches and Plein-air paintings. They were also a nice group to get to know. And, to be sure, Shari did a marvelous job! I will definitely still be recommending her work and her workshops to students. Here is a link to her blog. After attending a family friend’s wedding in the small town of Broadway recently, I stopped in the city of Harrisonburg to get myself an iced tea. I then settled in along a street that I have driven down many, many times since coming to Virginia. What was drawing my attention this day was the sweep of a low brick wall and the deep shadows that played in the trees and inside the walled area beyond the entrance. After three to four sketches to work out what interested me the most, I was able to execute a fairly fresh and simple watercolor of the scene. Back when I was a professor, as spring would melt into early summer, teaching would wind down and a bit of a respite would settle into my routine. I am reminded that back then summers were often the time of year that I traveled most. (Truthfully, it probably also had something to do with being a parent as well.) As I have re-organized my life to be pretty much a full-time artist … I still find that I end up doing many of my major trips away from home during these three to five months of summer-like weather. And for the past few years, when early June comes around, I get to judge art for about a week. So it is back on the road I go! This year, I definitely had to travel to that gig. I will post more about traveling as an artist (on the road and in the air) very soon.